The murlocs are busy working on prepping panels and assembling their contest entries, which can only mean one thing—BlizzCon 2015 is just a few months away! This year’s show is sold out, but those unable to join the festivities in person can experience the excitement from home with the BlizzCon Virtual Ticket, available to order now in the Battle.net Shop! With the BlizzCon Virtual Ticket, live online HD coverage will be at your fingertips on both days of the show, taking place Friday, November 6 and Saturday, November 7. You’ll enjoy two channels of content, featuring developer panels on the main and panel stages, exclusive in-depth interviews, the epic closing ceremony, and the community contests on Friday evening —this year hosted by author, actor, and all-around good geek, Wil Wheaton (@wilw). You’ll also have access to on-demand replays for up to two weeks after the show so you can catch up on anything you might have missed. As always, the Virtual Ticket also unlocks a treasure trove of in-game goodies for your favorite Blizzard games, including World of Warcraft, Diablo III, Hearthstone, StarCraft II, and Heroes of the Storm—more details to come at a later date. In addition, for the first time ever, Virtual Ticket buyers will also have the option to equip the Goody Bag that we give out to BlizzCon-goers in person. The Goody Bag is available to pre-purchase now through the Blizzard Gear Store for an additional $34.99 USD (plus tax, shipping, and applicable fees; limit 1 per Virtual Ticket), but supplies are limited, so be sure to lock in your pre-purchase before they’re all claimed. Visit our Goody Bag blog to check out the contents and learn more about how to order. The Virtual Ticket also grants you access to a limited-time online BlizzCon merchandise sale featuring a selection of commemorative items that will be available for purchase at the show. ** This special sale is scheduled to run from October 16 through November 8, and we’ll give you the low-down on all the loot that’s coming at a later date. Even if you don’t purchase a Virtual Ticket, you’ll still be able to catch plenty of BlizzCon action online for free. Coverage of the BlizzCon opening ceremony and this year’s BlizzCon eSports tournaments—including the StarCraft II World Championship Series Global Finals, Hearthstone World Championship, World of Warcraft Arena World Championship, and the first-ever Heroes of the Storm World Championship—will be streamed for free in HD at www.blizzcon.com. To order a Virtual Ticket, head to the Virtual Ticket Battle.net Shop page. For more information, read the FAQ below. * Virtual Ticket coverage will be available in English only. What is the BlizzCon® 2015 Virtual Ticket? The BlizzCon 2015 Virtual Ticket offers comprehensive live HD coverage of Blizzard Entertainment’s two-day gaming celebration, taking place November 6 and 7, via a multichannel Internet stream. Exclusive Interviews: Dig deeper into the Warcraft, StarCraft, Diablo, and Overwatch universes in exclusive interviews with Blizzard executives and developers. Limited high-definition coverage of the opening ceremony and BlizzCon eSports tournaments will be available online for free, featuring the Global Finals of the 2015 StarCraft® II World Championship Series, World of Warcraft® Arena World Championship, Hearthstone® World Championship, and Heroes of the Storm® World Championship. Keep an eye on www.blizzcon.com for more information. 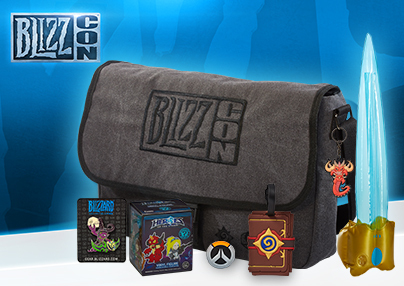 *Sold Out* Once I purchase my Virtual Ticket, how do I pre-purchase an optional BlizzCon 2015 Goody Bag? Once you’ve completed your Virtual Ticket purchase or redeemed your Virtual Ticket code, log in to the Blizzard Gear Store (http://gear.blizzard.com) using the same Battle.net account. 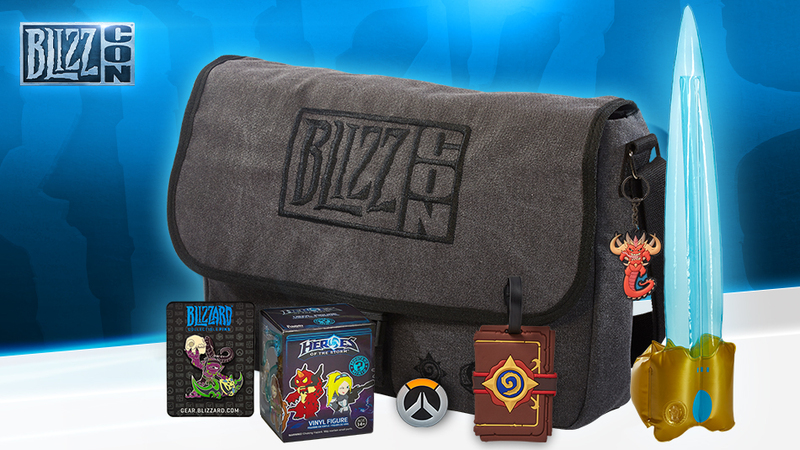 Look for the Goody Bag callout on the front page, or click BlizzCon 2015 in the top navigation bar, where you’ll be able to pre-purchase (limit 1 per Virtual Ticket and Battle.net account). Please note that BlizzCon 2015 Goody Bag *supplies are limited*, and buying a Virtual Ticket does *not* guarantee that you’ll be able to also buy a Goody Bag. Goody Bag orders will be shipped closer to the start of BlizzCon. For more information, see the FAQ. Yes—we’re setting aside a stash of BlizzCon merchandise for BlizzCon attendees and Virtual Ticket holders to be sold in an online merchandise sale scheduled to take place October 16 through November 8, 2015. We’re also planning a post-BlizzCon sale that’s open to the public after show concludes—we’ll have more details to share at a later date. Please note that items purchased in all of these sales will be shipped from the U.S., so international shipping rates and other fees may apply. The BlizzCon 2015 Virtual Ticket Internet stream and DIRECTV broadcast will be available in English only. Free eSports streams will be available in multiple languages through a variety of external channels—visit www.blizzcon.com closer to the show to find out if localized streaming eSports coverage is available in your preferred language. The BlizzCon Virtual Ticket is available in the Americas, Europe, Russia, Australia, New Zealand, Taiwan, South Korea, and Southeast Asia (pricing and availability varies by region). Keep in mind the Virtual Ticket stream will be available only in English. Live BlizzCon attendees also get a Virtual Ticket with their BlizzCon ticket purchase. BlizzCon ticket purchasers should have already received a code (one per ticket purchased) which can be used to unlock the Virtual Ticket, in-game goodies, and merchandise sale access on a single Battle.net account. These codes were emailed directly to the BlizzCon ticket purchaser, so check with the person who bought your ticket if you haven’t yet received your code. I plan to purchase the BlizzCon 2015 Pay Per View event through DIRECTV. Do I need to purchase the Virtual Ticket separately to also watch online? For those who choose the option to purchase the BlizzCon 2015 DIRECTV Pay Per View (coming soon), the Virtual Ticket Internet stream will be included with your order. After ordering through DIRECTV, you will receive an email containing a code that will grant one Battle.net account access to the Virtual Ticket Internet stream, the BlizzCon 2015 in-game goodies, and online merchandise sale. You will be able to redeem your code here—just make sure to redeem the code using the Battle.net account on which you wish to receive the in-game goodies. Note that the DIRECTV Pay Per View broadcast is not included with purchases of the Virtual Ticket made through the Battle.net Shop. More information on the DIRECTV BlizzCon 2015 Pay Per View event, including how to order through DIRECTV, will be available at a later date.